It is celebrated on 11th of September; it is both New Year’s Day and the Feast of St. John the Baptist. The day is called ‘Enkutatash’ meaning the “gift of jewels”. On the eve after dark the people light fires outside their houses. Lidet falls on December 29th on the Ethiopian calendar (January 7th on the Gregorian calendar). It is celebrated after 43 days of fasting with a spectacular procession of priests, which begins at 6 am and lasts until 9 am. It is celebrated seriously by church service that goes on throughout the night, with people moving from one church to another. Traditionally, young men played a game similar to hockey, called genna, on this day, and now Christmas has come to be known by that name. Christmas is a special celebration nowadays at lalibela. It has been celebrated by the Ethiopian Christians over 1,600 years. It falls annually between the 3rd and 4th week of the September. The feast commemorates the discovery of the true cross, up on which Jesus was crucified, by the Empress Helen, the mother of Constantine the Great. On the eve of Meskel tall branches are tied together with yellow daisies, popularly called Meskel flowers, placed at top is prepared at the occasstion of Demera. During the night these branches are set at light at gates or designated places. This symbolizes the action taken by Empress Helen who, when no one would show her the holy sepulcher, prayed for help. Where the smoke drifted she dug and found three crosses, one of them to be the True Cross, to which many miracles were attributed. Before the bonfire, celebration starts in the early afternoon priests in their bright vestments, students, brass bands singing a special Meskel song would assemble around the Demera (bonfire). Meskel also signifies the physical presence of the true cross at the remote mountain monastery of Gishen Debre Kerbe located in the Wolo region. Arrangement is made to keep the cross in a box of Gold. The priests of Gishen still safeguard this treasure along with Tefut, which is handwritten script in Geez on beautiful parchment. 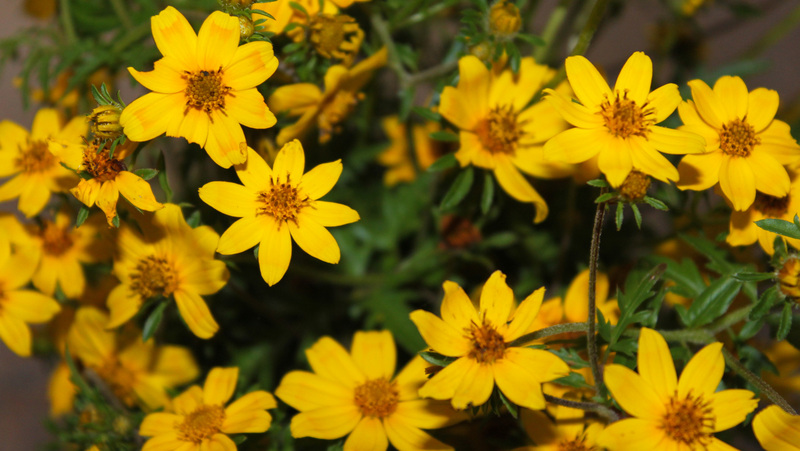 During this time of the year flowers bloom on mountains and plains and the meadows are yellow with the brilliant Meskel daisy. Dancing, feasting, merrymaking, bonfires and even gun salutes mark the occasion. Meskel is an occasion for Ethiopians to promote their spiritual life through reconciliation, social cohesion and peaceful coexistence. UNESCO has registered the Meskel festivity on the list of intangible cultural heritage of humanity in 2013. The Epiphany, or Visit of the Three Magi, is celebrated on 19 January every year. 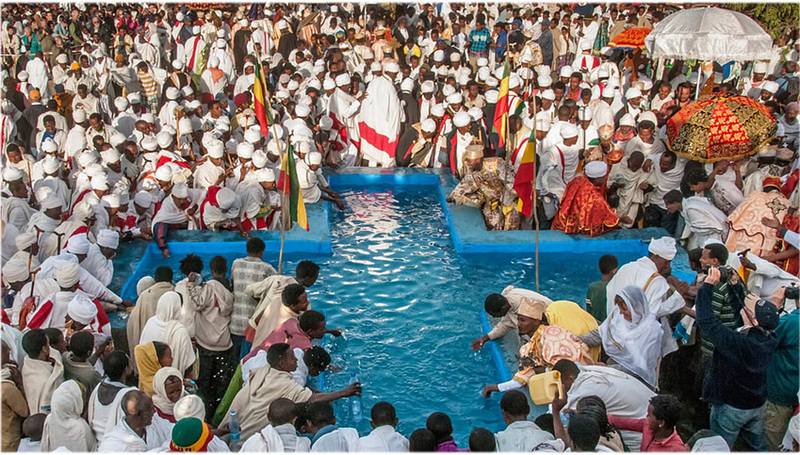 Celebration begins on the eve of the holiday, a day of fasting ‘Ketera’, when the priests bearing their Tabot (Replica of the Ark of the Covenant) and church paraphernalia, go down to a river, spring or pool for a mass baptism in respect of the Baptism of Christ. Feasting begins that day at sun-set, the whole ensuing night is spent in alternate prayer, hymn singing, and religious dancing , after which , before sunrise the sacrament is administered, through many of the priests. The chief priest then raises his hands over the water and bless it, whereupon the people would push themselves into the pool of blessed water. The great men and priests, however, do not immerse themselves, but instead get sprinkle from the water to obligate the necessity. At the conclusion of the ceremony the women and deacons dance and sing. 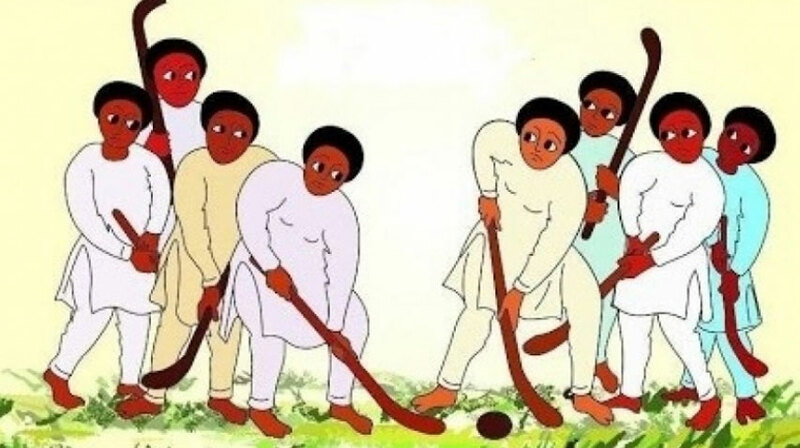 While the men engage in various sports, including ‘Guks’or traditional Ethiopian hockey and it is possible for young men to find their future brides at these festivities. On the following day which is dedicated to the Arch angel St Mikael there are further church ceremonies, as well as much feasting whereby the priests are always “well fed by their devout parishioners”. Ashenda or Shadey is a festival celebrated in August (G.C.) in the Tigray and Amhara regions of Ethiopia. 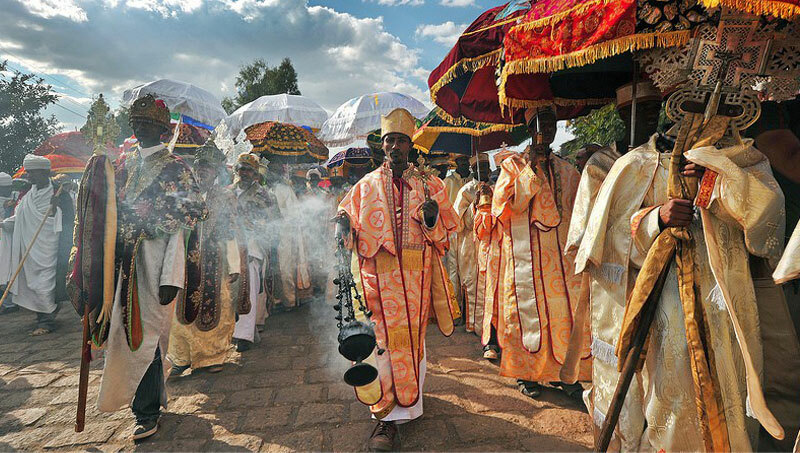 Ashenda marks the end of a two-week-long fast known as Filseta when adherents of the Ethiopian and Eritrean Orthodox Tewahedo Church gather to honor the Virgin Mary. The word “Ashenda” is currently used both in Amharic and Tigrigna languages to denote a vertical sewerage channel that passes rain water down to the ground from the top of a roof. In the Khimra sect of Agew, Ashenda means the “tall green grass”, of about 80–90 cm minimum height worn by girls around their waists during the holiday. In the tradition of this religious festival, blades of grass are strewn on the floors of homes and shops as a kind of welcome mat. The festivity of Ashenda has no common name throughout the country. For instance, in Raya, Enderta, and Tembien Regions historically it is known as Ashenda (Tigrinya: ኣሸንዳ), and is colorfully celebrated from August 16 to September 11 (according to Ethiopian Calendar). In Wag Hemra zone it is called Shaday , and in Raya Kobo it’s known as Solel. This cultural festivity originated following the legendary 17 years old girl who always used to walk around praying that her father would come back safe from war. When he did, she welcomed him singing and beating drums. Ever since then every year it became a tradition of all young girls to get together around singing and beating drums, while the young boys keep on an eye on them from a distance, to make sure they were safe from any harm. This took place in the Tembien region. 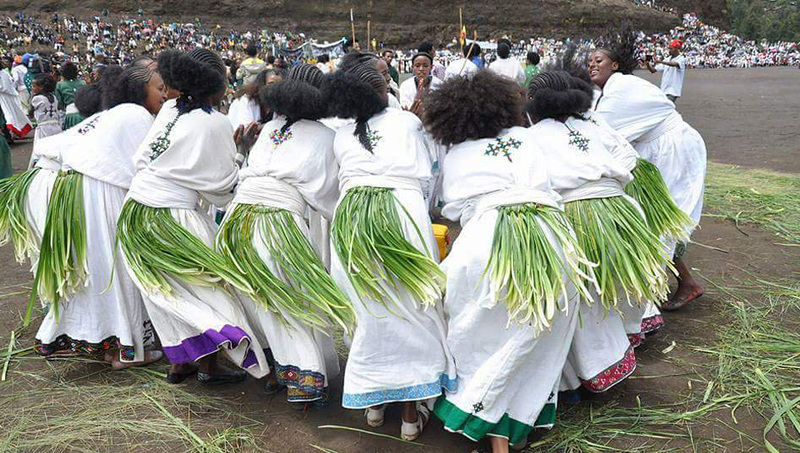 Irreecha, a Thanksgiving Day that comprises two distinct festivals observed on top of mountains and on the banks of rivers, is the most colorful and very attractive celebration the Oromo people mark for the glory of their creator (Waaqa). 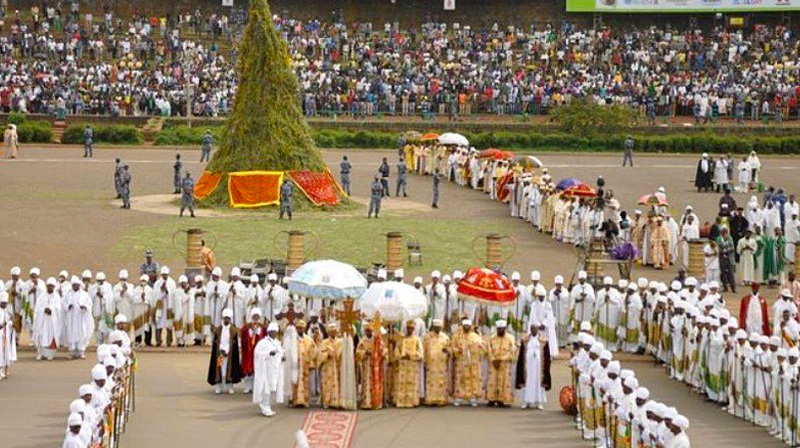 The Irreecha festival which constitutes the main part of the Gadaa system of the Oromo serves as a symbol of the Oromo people’s identity from time immemorial. The festival which attracts millions of people from all walks of life here and abroad is celebrated to thank, bless and pray to God (Waaqa) for their achievements and to their wish for peaceful relationship between nature and human. They plead to God for the health of their families, relatives, clan and their country as well as their livestock. 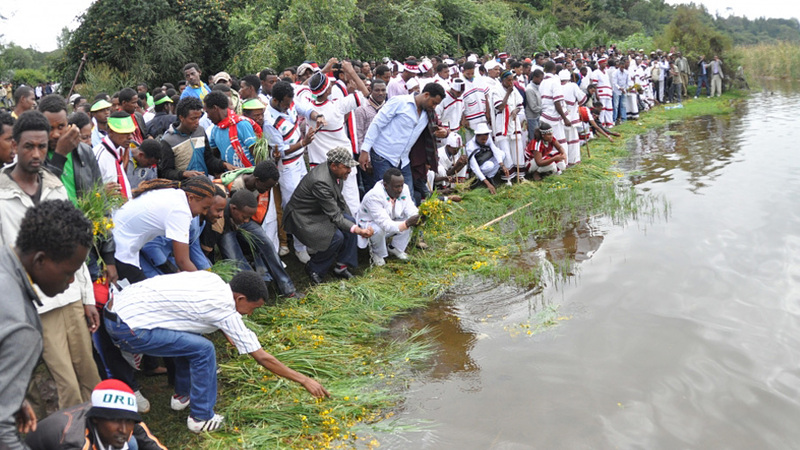 The Oromo people celebrate Irreecha at two locations: at mountain tops (Tulluu) and at the bank of rivers (Malkaa). The observance of the two festivals mark seasonal shift, either from winter to spring or spring to winter. The Virgin Mary is the most venerated of all religious figures in Ethiopia. About 33 days annually are dedicated in commemoration of Mary. The pilgrimage takes place once a year in the month of February to mark the anniversary of Sheikh Hussein’s death. Another pilgrimage loosely linked with Mauled (a pan-Islamic festival that marks the birth of the Prophet Mohammed) occurs later in the year. The rituals last for approx two weeks with huge crowd of people rarely less than fifty thousand, gather from across the country side. To some this is a once –in-a –life time experience. Others, however-those who know no other existence than the open road, make their way south through the Bale foothills to another shrine devoted to another Muslim saint Sheik Hussein. Pilgrims come on foot, on horseback and by mule from distances of up to 600miles to pay homage to the 13th century mystic prophet who lies buried in the town bearing his name. 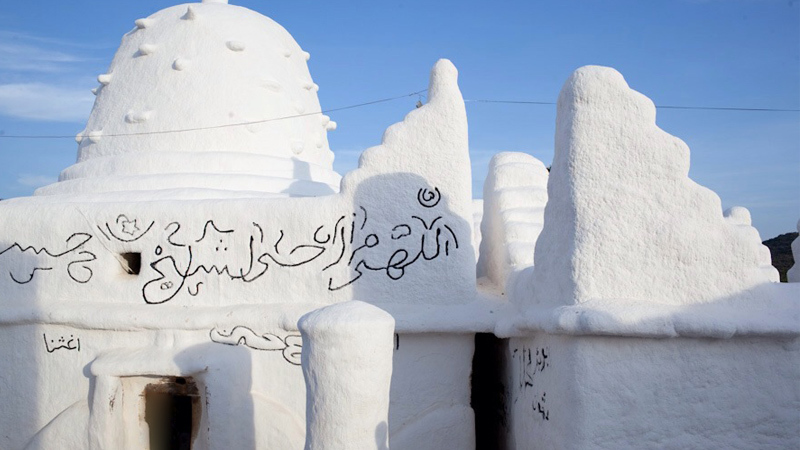 These pilgrimages take place twice a year, once in February- March to celebrate the anniversary of the death of Sheikh Hussein and once in August- September to celebrate the birth of the prophet Mohammed. On each occasion, approximately fifty thousand people come from all parts of the horn of Africa nation and stay for about 2 weeks. Usually the tomb of SheikhHussein is draped with colorful cloths for the occasion. Pilgrims enter the tomb daily to benefit from the healing power of this ancient miracle worked.